Tue 9:00 a.m. 5:00 p.m. Wed 9:00 a.m. 8:00 p.m.
Thu - Fri 9:00 a.m. 5:00 p.m.
-Each boat can be rigged with any Yamaha 4-stroke outboard to best suit the customers needs. F & S boat packages also include freight, boat preparation, battery, and propeller. Additionally, F & S goes with each customer to the water to ensure how to safely operate and enjoy their new boat. Optional Load Rite galvanized trailers are in stock to package with your new boat. Its streamlined design, top-of-the-class features and effortless maneuverability allows you to do exactly what you think it would: escape. This series' easy-to-tow size lets you get on the water in a hurry without sacrificing the amenities you love. Standard features like extra-large side rod holders, a huge lighted livewell, and downright impressive storage space keep this light package in line with the heavy weights. As a small token of our appreciation for the men and women who serve, we are offering a family discount for members of the US or Canadian military. 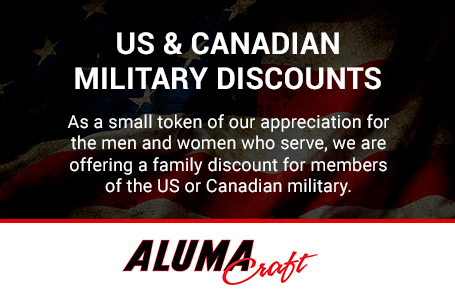 You can receive discounts on the Alumacraft models shown below. It's just our way of saying thanks for all that you do. (717) 632-6382 1800 Smith Station Rd. Mon: 9:00 a.m. - 8:00 p.m. Wed: 9:00 a.m. - 8:00 p.m.
Thu - Fri: 9:00 a.m. - 5:00 p.m.